So if you've followed my yellow coat indecision over the past few months, you'll know I've had a coloured coat in my sights for ages but I've not been 'feeling' it whenever I've tried them on. I adore yellow but it felt too OTT for my school run. It's also not a great colour for my skin tone - Donna is always telling me that I'm better going for a more orange/coral number. 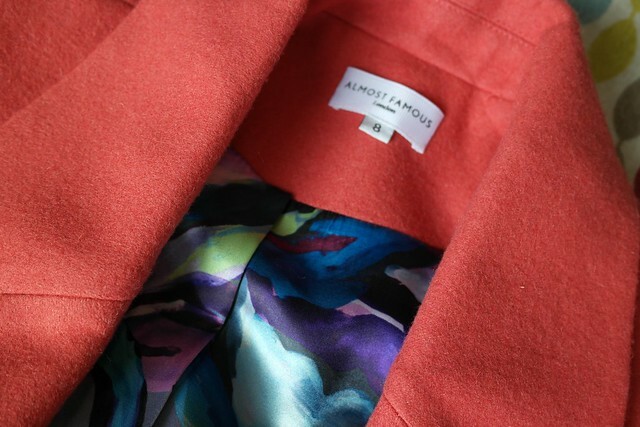 Then a few months ago, Almost Famous contacted me and asked me if I'd like to try anything from their AW14 stock...and I spotted this coral wool boyfriend style coat and decided to give the coloured coat one last chance. I've never bought from Almost Famous before so I wasn't sure what to expect but I was not disappointed when the parcel arrived. Not only was the coat beautifully packaged, it was the most amazing quality wool fabric with a stunning lining. Love at first sight! I had to hang it up for a couple of weeks as the weather was too warm but thanks to a cooling down in the temperature, it had the honour of being my '1st day back to school' coat - one of the few days I actually take photos at the school gate....and of course, my mum friends had to all gather round to make me super self conscious...though they loved the coat! I'm so pleased with this coat and it's going to be worn lots over the winter. Mainly because it's wool and therefore genuinely warm but also because it's an amazing colour. 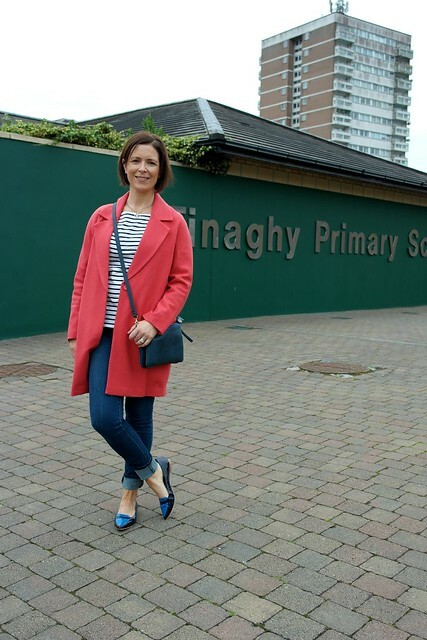 Not too OTT for the school run but it ticks the coloured coat trend this season without being a one season wonder. The fact that it's the perfect colour for my skin tone means I'll be wearing it for years to come. Here's to week 2 of back to school - and I've a few great posts coming next week, including the annual waterproof, bum-covering coat post! The colour on this coat is so lovely and you are right perfect for your skin tone. As much as I love yellow it is a colour I save for a great top not a coat. Not that I am adverse to a coloured coat I just am not feeling yellow & coat together! Anyways love your pick. Donna is right, it's a beautiful colour on you - looks such a stylish coat, I actually prefer a brighter colour to all the pastels that are around! This looks great on you. Perfect choice. I really love this coat on you, the colour is perfect. I am loving this yellow trend at the moment but like you, I know I wouldn't suit a yellow coat, its just too much, think I'll stick instead to a top or a scarf. I missed this post - how could I miss it? But I love the coat and the colour is fab on you. I've ordered a raspberry coloured one just recently but I've just returned it (surprise surprise) but only on the grounds that it was too big. I might try again though. If I don't succeed, I might be looking at this coat of yours! Fab coat, love that colour on you, you will get lots of wear out of it. The stripy breton is lovely under it too! Fabulous photo of you all on the front door step and the coat (and shoes) are stunning. You will wear this so much more than a yellow one! I've never heard of Almost Famous. Great coat though, well chosen! Gorgeous colour on you Avril....they stock that brand in Clerys and there are some beautiful pieces there for A/W:) Have a good week!